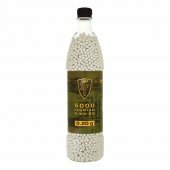 Badlands features Biodegradable Airsoft BBs at great prices! 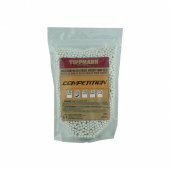 Shop around - we have the lowest prices on high-quality biodegradable airsoft BBs in Canada. 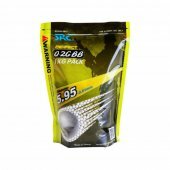 Airsoft Ammo and BB's There are 40 products. 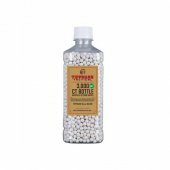 Airsoft BBs are small plastic 6mm balls used as projectiles shot from Airsoft Guns. There are a variety of Airsoft BBs available at Badlands. Different brands, weights, colours, quality and even Biodegradable options. When you are first getting started it can seem a bit confusing. Our goal is to help you select the Airsoft BB that will work best for you. Selection of the correct BB is dependent on player preference, airsoft equipment, game play and field requirements. Usually developed by each player over time, once they have figured out what has performed best with higher accuracy, desired velocity and minimal jams. Most players prefer .20g or .25g BBs for their consistency when shooting and affordability. 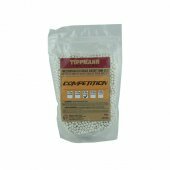 Airsoft Guns will perform best when the correct Airsoft BB is matched. Heavy BBs for example work best with Sniper Rifles or Higher Velocity AEG Airsoft Guns. A heavy BB is generally considered any BB over .25g. A sniper rifle airsoft gun can use really heavy BBs, while a player using AEG rifle would get a lower velocity using heavy BBs. Standard .20 and .25g BBs will work for most game play, while most snipers will use .25g or .32g BBs. 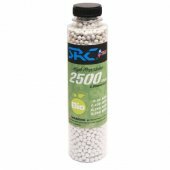 Certain Airsoft Facilities could require the use of Biodegradeable Airsoft BBs, while other might not allow Biodegradeable BBs at all. Most players just buy multiple BBs so they have options to play anywhere. 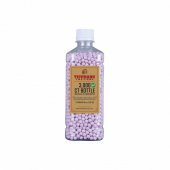 We recommend trying a variety of different Airsoft BBs to identify which one gives you the best desired performance. It is not uncommon for an Airsoft facility to require certain specs, so we stock a wide variety of quality Airsoft BB options. Some of the common factors in Airsoft BBs. Most Airsoft guns are designed to use a 6mm airsoft BB. Ammo size specification is usually listed on the packaging. For example, G&G bio ammo lists a sizing spec of 5.95mm +/-0.01mm. 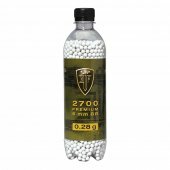 Airsoft BB ammo is made to a weight specification, measured in grams. The standard weight is .20g. Lighter weight ammo such as .12g rounds are available in 6mm, but these were generally intended for lower powered “clearsoft” guns. Using these in a higher powered airsoft gun can lead to performance issues and/or damage.The more the ammo weighs, the more accurate it flies. However, it will also decrease in speed. Personal preference on a balance between speed and accuracy will be the main determining factor behind what weight to use. It is uncommon to use ammo .30g or heavier outside of a high powered or heavily modified airsoft gun. NOTE: Whenever weight is changed, the hop up on the gun must be re-calibrated to the new ammo. 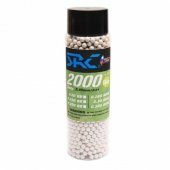 Airsoft BBs come in a variety of colours, the most common being white. Colour will have no impact on BB performance, only visibility. Some players prefer a darker coloured round so it is more difficult to see where they are shooting from. 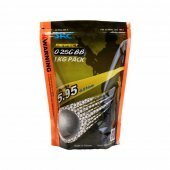 Quality of ammo will greatly impact performance. High quality BBs have a smooth, round even finish. They shoot accurately, consistently and have minimal jams. A poor quality round will have poor accuracy and consistency, or even worse, cause jams in the gun. Ammo that is not uniformly round will often be misdiagnosed as gun-based fault, so when troubleshooting, one of the first steps should be determining what type of ammo is being used. Often the solution is to simply switch to a high quality Airsoft BB. Most fields require the use of biodegradable ammunition. We suggest having a supply of Bio and Non Bio so you are not limited to where you can play. The most common material used in Bio ammo is PLA, a biodegradable material made from plant base. Under ideal conditions it will completely decompose in under 90 days. Non-Biodegradable ammunition is made of a traditional plastic that takes years to break down, which leads to issues of build-up and site contamination. Some indoor fields will require the use of non-biodegradable ammo, as it is less likely to shatter on impact.